Posted by admin in Canary Islands, daily volcano quote. The 31st, they discovered a great light on the side of Monja, towards the white Mountain, and the first of January last, the Alcalde of Guancha writ to that of Teneriff, that having sent to the Peak of Tyda, they had seen the Earth open towards Monja, which had formed a Volcano, or Mouth of Fire. That another had soon appeared, and that both had vomited up such vast quantities of Stones, that they had formed pretty high Hills; and that the combustible matter which came out of those Gaps had made about 50 Fires in the Neighbourhood. These Volcano’s continu’d till the 5th to vomit up glowing Stones, which burst to pieces either in the Air, or falling on the Ground with a most terrible noise. The Air was then darken’d with Ashes and Smoak, which encreas’d the consternation of the People, especially at Night, when they saw the Country above a league about all over Fire. This proceeded from another Volcano, which had about 30 different Mouths in the circumference of about a quarter of a league, on the side of Orotava, and from the Eruption thereof was form’d a sort of Torrent of Brimstone and other Bituminous Matter, which ran towards Guimar. The like was form’d by the other Volcano. The Shocks continuing, with the same violence, the Houses and Publick Buildings of Guimar were overturn’d. The Bishop of the Canaries, having taken a World of Trouble among that general consternation, fell sick and dyed. From The Post-Man and the Historical Account, 28 April 1705. The Tenerife eruption being described is that of 31 December 1704 to 27 March 1705. 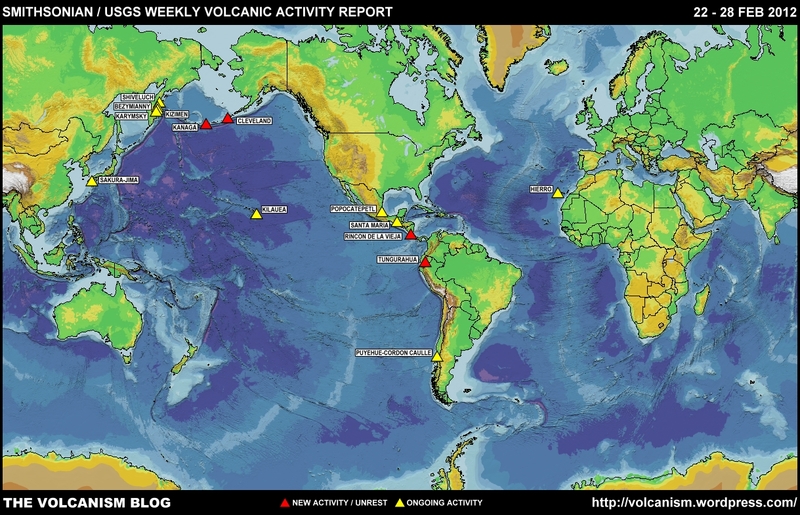 Posted by admin in Atlantic, Canary Islands, Cape Verde Islands, volcano monitoring. The Canary Islands and the Cape Verde Islands are volcanic archipelagoes off the Atlantic coast of Africa: the Canaries constitute a territory of Spain, while the Cape Verde islands are a former Portuguese colony which is now an independent republic. Both are volcanically active, and volcano monitoring is a priority for both island groups. The Instituto Tecnológico y de Energías Renovables (ITER) of Tenerife is involved in an extensive programme aimed at strengthening volcano monitoring in Cape Verde, reports Canarias 24 Horas. In collaboration with the Laboratorio de Engenharia de Cabo Verde (LEC), the Department of Science and Technology of the Universidade de Cabo Verde (UNICV) and the Cape Verde Serviço Nacional de Protecção Civil (SNPC), ITER has been providing training and technical resources to enhance volcano monitoring and hazard mitigation in Cape Verde. Particular programmes under way include the strengthening of local capacities for geochemical volcano monitoring, the measurement of volcanic gas emissions on São Vicente and Fogo islands, and the measurement of thermal energy release associated with gas emissions at Pico do Fogo, which has been the focus of recent volcanic activity in the Cape Verde Islands.